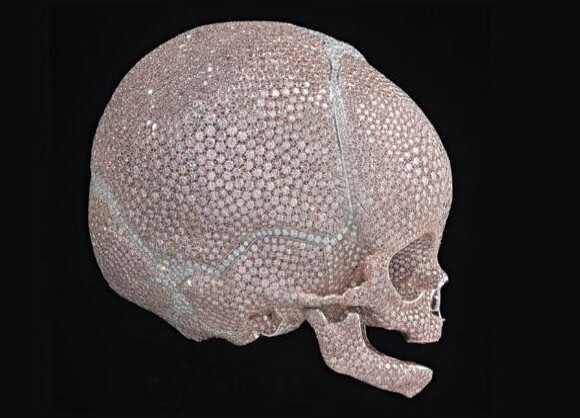 Art world provocateur Damien Hirst’s latest work, an authentic baby’s skull covered in platinum and diamonds, is causing controversy in the UK. The sculpture (above), entitled For Heaven’s Sake, is a follow-up to the Brit artist’s astounding $100 million diamond covered skull which he debuted in 2007. The new work is based on an infant’s skull believed to be that of a newborn less than two weeks old from a 19th-century pathology collection that Hirst has acquired, the London Telegraph reports. Cast in platinum and set with more than 8,000 white and pink diamonds by royal jewelers Bentley & Skinner, the skull will be exhibited later this month at the Gagosian Gallery’s new space in Hong Kong and will be shown in London later this year.